Lot 49, a Snitzel x Ichihara colt offered by George Altomonte’s Corumbene Stud, was knocked down to Harron for $2.8m, making him the most expensive Snitzel progeny ever sold and the best result Corumbene has achieved since it started selling horses 48 years ago. Harron was in awe of the record colt (pictured), describing him as a “very special horse’’. “He was very busy here the past week, I was making him busy to an extent but how he handled himself was quite rare,’’ Harron said of the youngster, which will be trained at Randwick by Peter and Paul Snowden. “I want to keep seeing them, see how they’re handling it, their temperament but he never had his head out of his feed bin, he never got upset, he just put his head down and marched every time and focused. Seeing that focus from a colt is extremely important. “I’ve been doing this a long time and when you get a result like this, the staff at the farm are so excited. They feel it, once you get something that tops the sale or might do so, it makes them all feel pretty proud and I’m happy about that,’’ Altomonte said. “I thought he’d make between $1m and $2m because of the enquiries I’d had, the right people had been in contact in the lead up so I knew he’d sell well. The day’s second-top lot was a stunning Fastnet Rock x Legally Bay colt (lot 88), which Aquis Farm purchased from Segenhoe Stud (on behalf of clients Chris and Jane Barham) for $2,300,000. “I’d seen the horse a couple of times at the farm, seen him through the prep and obviously I’ve seen a fair few Fastnet Rocks in my time at Coolmore, he was the pick of the horses here and the pick of the horses I’d seen all year,’’ Aquis’ Shane McGrath said. “He was a standout colt from the day he was born. You bring him to a sale like this, we knew he’d sell well but we didn’t envisage he would make those numbers,’’ Segenhoe’s Peter O’Brien said. “A lot of credit needs to go to Inglis for getting all these people here. Everyone is here and for a vendor, that’s so important. Inglis Managing Director Mark Webster was thrilled with the day’s trade. 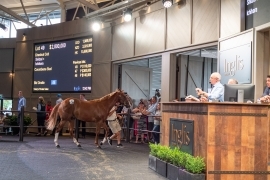 “It’s been an outstanding day of trade, a great start to a refined Easter Sale format that was aimed at providing buyers with a more select offering. My team has worked extraordinarily hard to attract a diverse and deep buying bench and this effort is paying off,’’ Webster said. “To end Day 1 with an increasing clearance rate of 81% is a strong start and something that I’m confident will continue to climb overnight and into tomorrow’s action. To view our Inglis TV story on seven-time Olympian and part-time horse trainer Sir Mark Todd, CLICK HERE.